The Fulton Marsh constructed wetland was developed in 1997-1999 in conjunction with upgrades to Whitemud Drive. Its primary purpose was to provide regional stormwater storage to reduce downstream flooding of Fulton Creek. 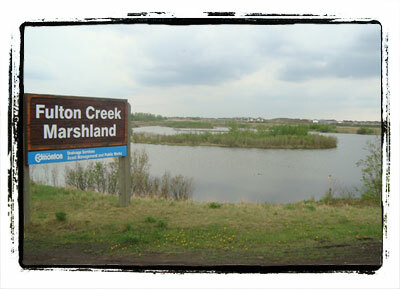 The marsh is an on-line system within Fulton Creek and is the largest stormwater facility in Edmonton. Construction of this facility included many naturalization features aimed at encouraging the establishment of native plant communities. Since its original construction, marsh and upland plant species have proliferated into a well-developed and diverse habitat. Fulton Marsh supports excellent native upland species and a diverse assemblage of submergent and floating vegetation. The large open water portion of this site provides excellent habitat for waterfowl nesting, feeding, resting, and raising young. Limited parking is available at the northeast of Fulton Marsh. Trail access is provided around much of the perimeter. 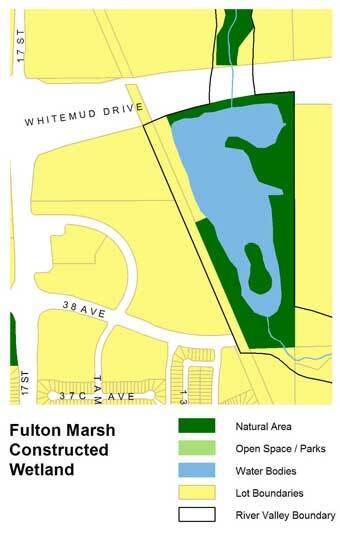 Fulton Marsh is located at 903 45 Avenue N.W. Limited parking is available at the Fulton Marsh site at the northeast corner of the facility off of Whitemud Drive. Informal trails are present around much of the wetland’s perimeter which provide excellent wildlife viewing and walking/exploring opportunities. Fulton Marsh provides excellent opportunities for viewing waterfowl as it provides habitat for nesting, feeding, resting, and raising young to many species of migratory birds. Several amphibian and small mammal species are present at this site and deer, coyote, and muskrat have been observed here.